In previous posts, we covered how to run the backend Spring Boot application and how to run the frontend with Angular. However, it’s much easier to run everything together in Docker containers. I won’t detail in this post how to configure everything needed to make this work – that’s a different blog entry -, but let’s see how to execute it. You’ll find in the GitHub repository this docker-compose.yml file, prepared with everything needed to build and run the images. A mongo container with a volume to persist the data between different executions. A backend container connected to the mongo container and exposes the port 8080. The frontend container exposing the internal port (80) to the host’s 8900. If you want to stop them you can run docker-compose stop from a different terminal, or press Ctrl-C from the one which is running the containers. You can also run docker-compose in daemon mode if you prefer so (with the -d flag). Let’s start our comparison with the most noticeable difference from the point of view of Web Users: user experience. We’ll use the frontend for this comparison. Playing the user’s role is quite simple in this application: enter values for the given parameters (pagination, page number and size) and press either the Reactive Request or the Blocking Request button. That will put our implementation into practice, calling the backend services from the web page and processing the response either as small portions (WebFlux) or as a whole thing (MVC-like). This is covered by the previous posts, so I won’t dive into details. You’ll find out quickly that for the non-paginated requests and for big page sizes, the Reactive user’s experience is way better. You don’t need to wait for the request to finish to start reading the quotes. And this is just a simulated scenario in which we’re forcing a constant delay per element from the server. In a real situation, where the server’s response time and the network latency may vary unpredictably, the benefit would be even more appreciated. As mentioned in the first post of the series, it’s a fact that web users abandon slow sites. If you’re running, let’s say, an online shop, you better show a few products as soon as possible to your potential customers than keeping them waiting for all the content to appear at once. 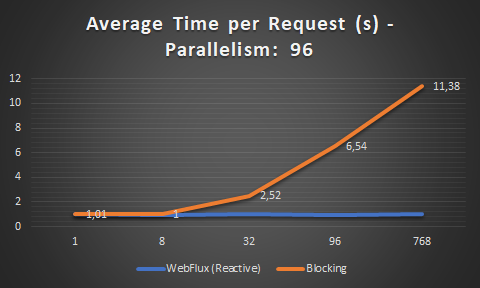 This is an interesting topic: one might think that going reactive for the Web with WebFlux may introduce some total delay in the total time needed to deliver a response. As we’ll see in the benchmark figures, that’s true if we examine requests executed one by one, but where the Reactive web approach shines is when we measure the whole performance of the server when handling multiple requests at the same time. The results shown are extracted from a benchmark that you can run yourself. In the GitHub backend’s project folder, spring-boot-reactive-web, you’ll find the test class BenchmarkTest. Remove the @Ignore annotation and run the tests or just use your IDE to execute it. I used an Intel Core i7 @ 2,5 GHz with 1 processor and 4 cores for the test. The backend runs from IntelliJ IDEA (not Docker). I didn’t modify the default configuration for Netty, which in my case is running 8 parallel server threads. The total number of requests to execute. How many requests are going to be performed in parallel (parallelism). To avoid potential differences in the implementation, both reactive and not reactive requests are executed using a WebClient. I also tried with RestTemplate for the blocking part with very similar results. The log levels of the application are set in the repository so you can get some valuable information from them when running the Benchmark: threads started, locks being acquired and released, etc. As you can see in the graph, WebFlux scores much better for a high load. It’s capable of processing almost all the requests in parallel, reaching 30 requests/second when we execute 32 requests at once and 90 requests/second for 96 simultaneous calls. When we execute blocking calls, the server can’t process so many requests in parallel so it’s clearly limited by the number of server threads running, eight in this case. 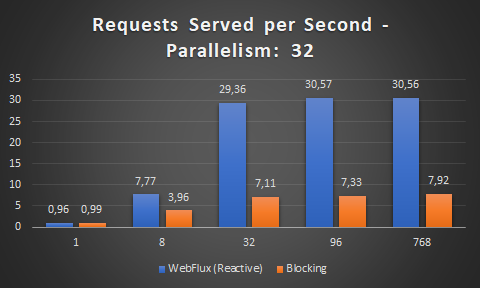 This proves that a Reactive Web approach optimizes the server resources by unloading the server’s threads and processing the requests separately, in parallel. This metric also shows WebFlux as the winner option. The Netty server keeps all the reactive requests close to the minimum of one second, which is indeed the consequence of the server being able to cope with almost every request in parallel. On the blocking landscape, the higher the number of parallel requests the longer the request takes to complete in average. This makes sense: since all the server threads are busy, the remaining requests need to wait, thus increasing the average time. The business translation: most users are unhappy because the web page takes a long time to load. This is the most subjective angle that we can use to compare both approaches. However, I consider it very important: it would be risky to blindly choose WebFlux because of its performance if our knowledge is not good enough to implement the solution using Reactive Patterns, or if there’s no good documentation for it. You might end up with an amazingly-performing web server which is a nightmare to maintain from the development point of view. On top of that, you should evaluate if a full-reactive stack fits your case. Do you require a SQL query to complete your Web response? Bad news: there is no good support for reactive SQL drivers yet. Analyze in advance if all your layers can handle this new programming approach or you may be blocked by the weakest chain element (the blocking one). Writing Unit and Integration tests for reactive streams with WebFlux might be tricky. The Project Reactor documentation is a good starting point, showing how you can use StepVerifier to check that your Fluxes and Monos work the way you want. You can also find examples of Unit Tests inside our backend application in the GitHub repository. An extra inconvenience is that there is not yet a big community of developers from where you can see examples of testing with WebFlux. Besides, the tests are not as readable as with MVC, and they are harder to debug if something goes wrong. 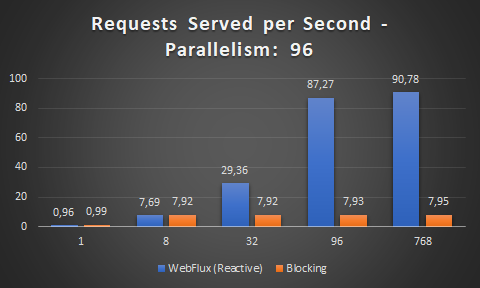 As any other technology choice, WebFlux (and the Reactive Web approach in general) has advantages and downsides. Don’t go for it just because it’s the new thing or you want to practice (for that you can build sandbox experiments like this one). As I covered along these series, WebFlux brings performance benefits and can also leverage the experience you provide to your users when they’re waiting for the response’s data. On the other hand, reactive programming comes with new ways of writing, testing and debugging code so it’s not a quick transition. I always recommend a very good analysis of not only suitability to what your application needs to accomplish, but also of your environment from a common-sense, and human-factor perspectives. Is the development team ready for the change? Can you solve all the challenges you’ll face? Will you really use the benefits or are they just nice-to-haves? For an existing project that may take advantage of it, I’d rather try it in a limited scope – a few of your total requests that may, for example, map to a microservice (or module, or component) in your system. Evaluate the results, then you can smoothly refactor the rest if you like them. I hope you enjoyed this guide. Feel free to give me some feedback via comments, Twitter, GitHub, or any other channel you prefer. Can i know how you generated graph for performance comparison? It’s just one of the templates over an Excel spreadsheet, is that what you’re asking? I think there is an issue with the benchmark. Looking at the github repo, it seems to me that both the blocking part and the reactive part of the benchmark run with WebFlux in the server side. Yet, the article states that the blocking part runs on WebMVC (“WebFlux vs. Blocking (MVC): performance”). To obtain a fair comparison, the blocking part should indeed be realized on WebMVC. WebFlux having only 1 thread per core (to reduce context switch overhead), it is extremely sensible to blocking. This thread limit explains that the request served per second is limited to 8 which is the number of core here. Did I misunderstood something here ? Thanks for your insight. Hi Quentin. You have a good point about the web server set up. If you boot up the ‘classic’ web server version, you’ll get different server settings by default (basically more connection threads) that will lead to a better performance on blocking scenarios. However, the point of this comparison was demonstrating that the Reactive Web approach can make better use of the resources, in this case not being that limited by the number of threads. I’ll add your remark to the article, thanks a lot for your comment! You are proving your point by inserting Thread.sleep in the controllers which does not show a behaviour of a real-world app. In fact removing these sleeps shows that standard blocking requests behave better in terms of performance for simple repository retrieveing of elements and significantly better when there are some additional operations on the stream like mapping or filtering. It would be wiser to show that there are benefits of reactive programming when we are dealing with high latencies or unpredictable response times from some networks, but for typical scenarios it’s much wiser to use typical blocking model. Thanks for your comment! Well, not including Thread.sleep() would make the performance test also unfair when running it locally, since you would be dealing with the ideal scenario of no network latency. The fact that it’s there it’s properly explained along the posts – it is intended to simulate bad network conditions. 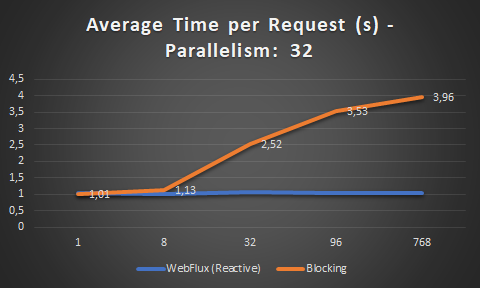 I agree with you, and I believe it’s clearly stated in the guide (see Blocking vs. Non-blocking), that WebFlux has some nice advantages over the blocking model when there are unpredictable latencies. However, I don’t agree with your sentence “for typical scenarios it’s much wiser to use typical blocking model”. Defining a “typical scenario” is not a trivial task. Like many other software decisions, it depends on multiple factors and that’s what I try to explain in the conclusions. Ideally, it would be nice to compare both approaches without the sleep statement and perform requests from multiple geographical areas in the world to an average server, then I believe the point would be clear. I’ll try to set up something like that if I can. Thank you very much for the helpful writing. 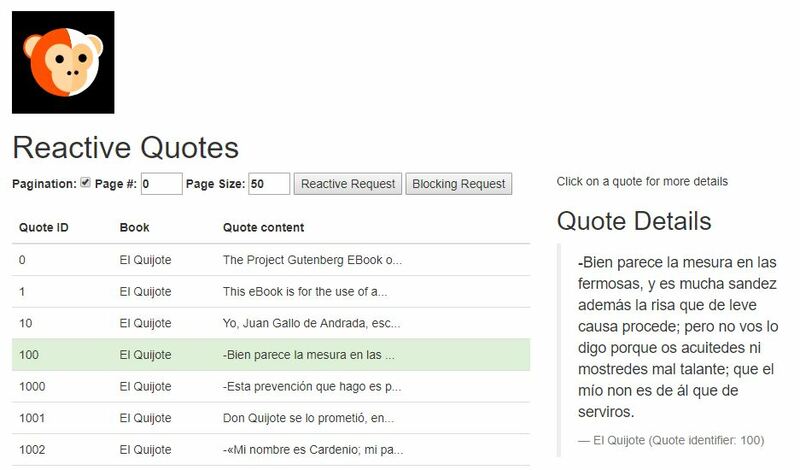 In your example, the controller provides the page attribute, but the client calling your service can not know how many pages are left, as the page is not given in the response. Do you have any idea how cursor-based-pagination can be implemented in a reactive way? Really good question. Check this answer on StackOverflow by a Spring Data Engineer. I agree with that answer: pagination goes a little bit against some reactive patterns. Also, bear in mind that the total number of records might grow while you consume them from the frontend. However, I do understand the requirement in some situations. For example, if you want to know in advance, on frontend side, how long is going to take to retrieve all results to provide a better user experience (like a progress indication). The simplest solution is just having a separate endpoint to provide this information. Check this pull request: https://github.com/mechero/full-reactive-stack/pull/1/files.